Legislation that axes automatic housing benefit for 18-21 year olds must be “challenged and changed,” says an east Kent homelessness charity boss. Mike Barrett, chief executive of Porchlight, has slammed the benefit changes which come into effect from 1 April but were first unveiled in 2015. The changes mean single, unemployed 18-21 year olds making new Universal Credit claims will not be eligible for housing benefit. The policy will not apply to those young people with dependent children, care leavers, those classed as ‘vulnerable’ or where it would be ‘inappropriate’ for them to live at home, those in temporary accommodation or young people who have been working for the previous six months. It will not affect supported housing until 2019. But homelessness charities including Porchlight and Centrepoint have warned the exemptions are not exhaustive enough and will make it difficult for under 21s to find a safe home. Mr Barrett says the cost of increased homelessness to councils would wipe out virtually all of the planned £95m saving to the benefit bill outlined when the policy was first suggested. The government has also been warned by the charity sector that even where a young person would qualify for housing benefit through the “inappropriate to live at home” measure; they would need proof of a tenancy before they can claim benefits under current rules. This, they say, will create a catch-22 situation, because it is highly likely that landlords will be unwilling to let to 18-21 year olds because they will be unable to provide proof of income. Proving it is inappropriate to live at home, a status which will have to be renewed every 12 months to continue claiming benefit, could also be an extremely difficult burden for young people. A related Budget announcement set out plans to introduce a Youth Obligation for 18 to 21 year olds on Universal Credit from next month. The Parliamentary Under Secretary of State for Welfare, Caroline Nokes, said that “in the region of £105 million” would be saved by the new regulations over the period of this Parliament. 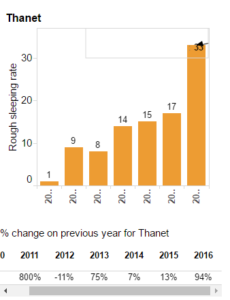 The impact of the changes could mean Thanet experiences an increase in young people sleeping rough, said Mr Barrett. He added: “As Thanet has some of the highest numbers of homeless young people and care leavers in this category, it is likely that the area may see an increase in young people sleeping rough. 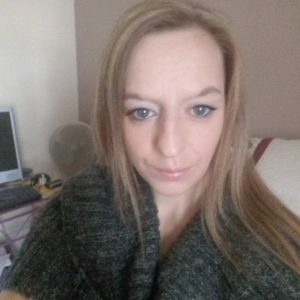 “However, this particular cohort are always at severe risk of harm and exploitation from gangs and other unscrupulous people looking to take advantage and make money from using young vulnerable people. It is a view echoed by Kerry Keating, who is the founder of Thanet’s Families in Need and food bank service. The Ramsgate mum-of-four, who has been volunteering with the isle’s winter shelter scheme run by Thanet council, said: “I am hugely concerned that housing benefit is to be axed for 18-21 year-olds within weeks after ministers decided to go ahead with these unbelievable plans. “Hearing the government plan to force young, unemployed people to live with their parents or pay their own rent as if it was simple as that is diabolical. “We are in one of the most deprived areas in the country, facing a huge housing crisis, with homelessness rising steeply due to government legislations making support for even the most vulnerable hard to get. “I can imagine homelessness for the younger generation rising at very steep rates. We simply do not have the employment prospects the government seem to think is available. “ Another issue we already see through the rise of homelessness for young families and lack of accommodation. This creates overcrowding issues through three and four generations having to live in the same house while trying to gain a private property or waiting to be accepted for social housing. According to charity Homeless Link Thanet saw a whopping 94% rise in the number of people on the streets between 2015 and 2016. The figures show a count of 33 rough sleepers in 2016 compared to 17 the year before. 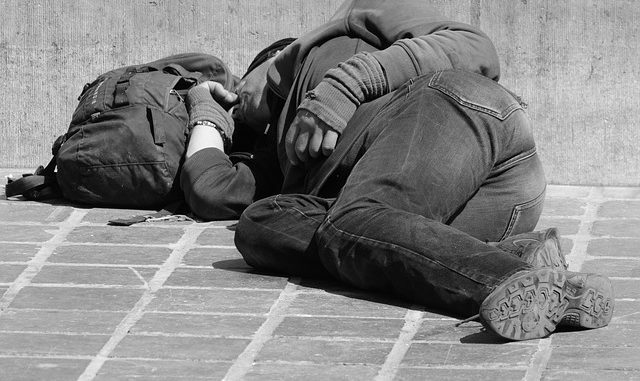 The charity, Porchlight, claims a total of 223 people slept on Kent’s streets between April and June 2016, compared to 106 in the same period of 2015.